As with all children, I'm keen that Natty gets a good balanced diet. A weakened immunity and frequent constipation, however, mean that I have to pay particular attention to keeping her hydrated and supplying her with her recommended daily dose of vitamins and between 5 (and more ideally 10) portions of fruit and vegetables a day. Encouraging a child to eat more fruit and veg can sometimes be tricky and requires some sneakiness on your part. Try blending veggies into pizza sauce or packing them finely-chopped into soups, as well as making artistic creations with fruit. You might also consider playing counting or sorting games with fruit and veg. Natty finds drinking from an open cup difficult and as a small child she was prone to aspirating liquid when she swallowed, so we find that a straw suits her best. This coincidentally also helps improve the oral muscles needed for speech. 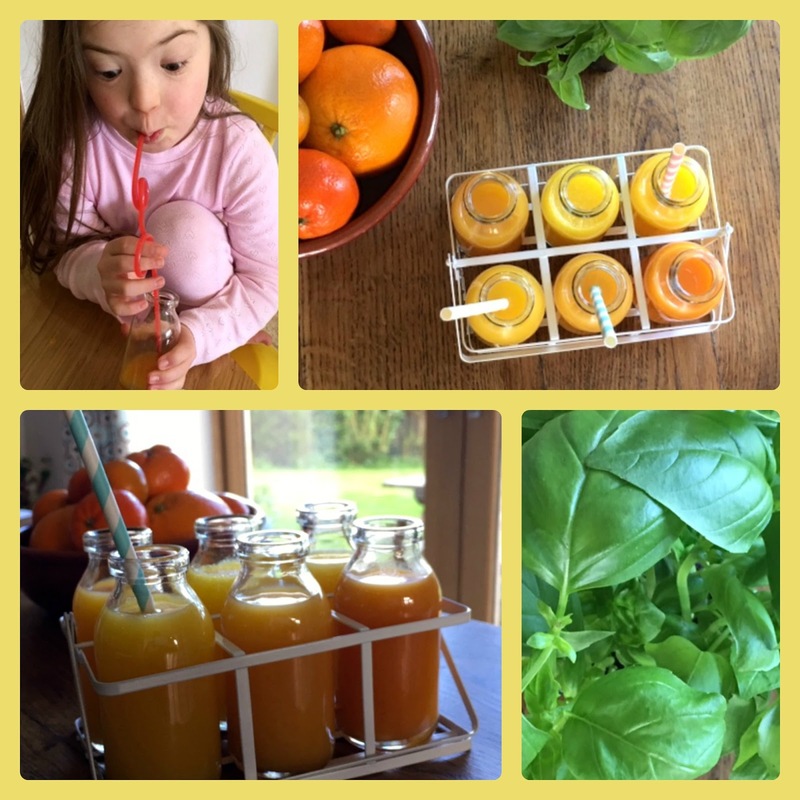 I employ lots of tricks to encourage Natty to drink more, such as buying funky straws and cups or pretty novelty bottles and allowing her one 150ml portion of her favourite pure, fresh juice each day. Thankfully this actually counts as one of the 5-10 a day, and she finishes it with gusto. Along with the rest of the nation, Natty's juice of choice is orange juice, which is great, not least because it contains 100% RDA of vitamin C as well as potassium and folates which help with cell repair, as well as boosting her immune system. Natty always drinks her juice with one of her meals, usually breakfast. This way it helps with the absorption of iron in the food, and was also recommended by our family dentist as being kinder on teeth. Recently we have been working on Natty's life skills and using every day situations as a basis for learning. 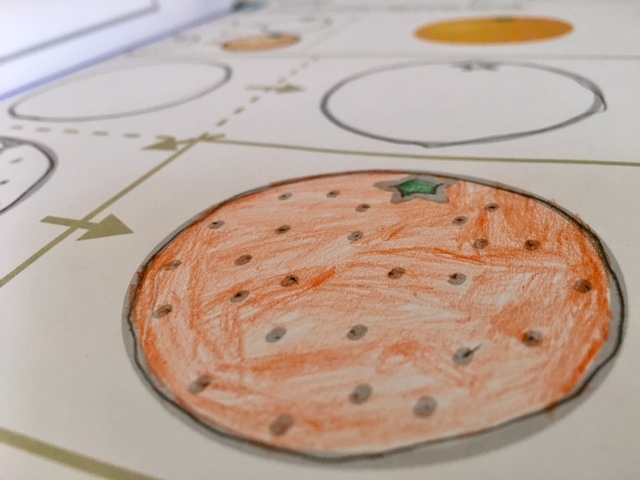 Natty drew a beautiful picture of an orange (before wolfing down the still life example) and then used the picture as a prompt to help choose and buy a bottle of orange juice from our local supermarket. Not only does this help her learn about shopping and money, but also what makes our bodies healthy for life. I am working in a paid relationship with the British Fruit Juice Association on their #FruitJuiceBoost campaign. #Ad. 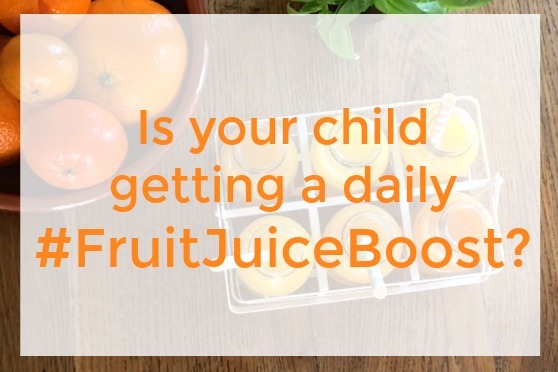 Discover the benefits of 100% fruit juice in your children's diet. All your juice questions can be answered here.